1. How successful was the viral nature of the campaign? 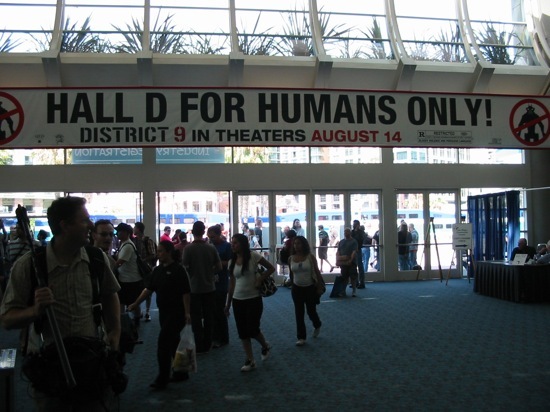 Overall, the viral nature of the campaign for District 9 was very successful. People from all different locations spread the word, which questioned "What exactly is the For Humans Only all about?". The viral campaign got a lot of people interested from the beginning because the designs were so intriguing. After seeing the advertisments in public places, people would go home and conduct research, to find out more about it. The designers ot the marketing campaign continued to give segments of the film away occasionally, as it began with the distribution of ads in public places, followed by the online websites, then photos of the characters within the film began to publish. A teaser trailer was then created and distributed around cinemas, but with the faces of the characters slightly blurred. However, five days after the final trailer was published for all to see and the faces were no longer blurred and there were subtitles along with it. The marketing for District 9 had done its job successfully, as millions of people were anxious to watch the film. Along with that, the campaign was also successful in that it got distributed via e-mail, as many got e-mails sent to them containing photos of the ads on benches and bus shelters. Furthermore, fans were also getting drawn in and created viral campaigns. 2.. What marketing or statistical information can you find to support this? As a whole, the movie, District 9, itself was a huge success in America and a lot of credit for the movie's success does link to Sony's vial marketing campaign.Research shows that District 9 was a huge box office success and the film was ranked "first at the weekend box office". The film also had an opening success, which was mainly down to the unique marketing campaign that the film had. It also had a good success rate in the United Kingdom, showing at 447 cinemas, with an opening gross of £2,288,378. Furthermore, according to Sony Pictures over 33,000 people called the number seen on the ads, which goes to show that the nature of the viral campaign was a success because it got people involved and created quite a stir.